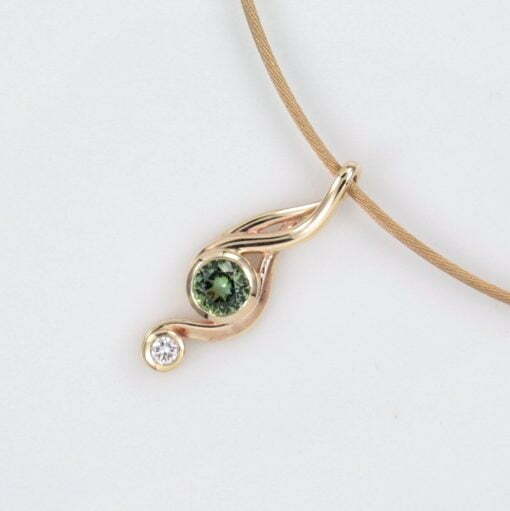 This gorgeous organic flowing Pendant design features a beautiful Round Cut Apple Green Tourmaline. Accompanied by a dazzling 0.20ct Round Brilliant Cut Diamond and together set in 9ct Yellow Gold. 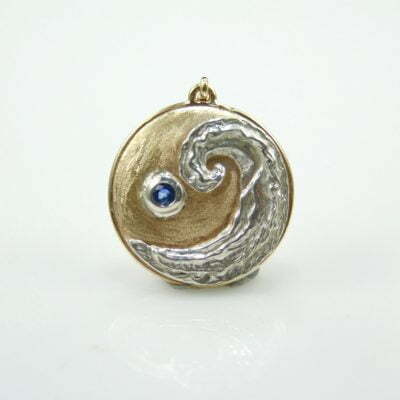 We have used Bezel settings to help highlight the clean flowing lines of this pendant and these gorgeous hero gemstones. Tourmalines are renowned globally as the traditional birthstone of October, and more interestingly the array of colours they are found in – colours of the rainbow. Tourmaline has a hardness of 7-7.5 on the Moh’s Scale of hardness. Diamonds are possibly the most famous and sought-after gemstone throughout history and in today’s society. Diamonds have a hardness of 10/10 on the Moh’s Scale of hardness – second to none. We love diamonds for their exceptional brilliance and ability to reflect light. This is the reason why they are so sparkly! 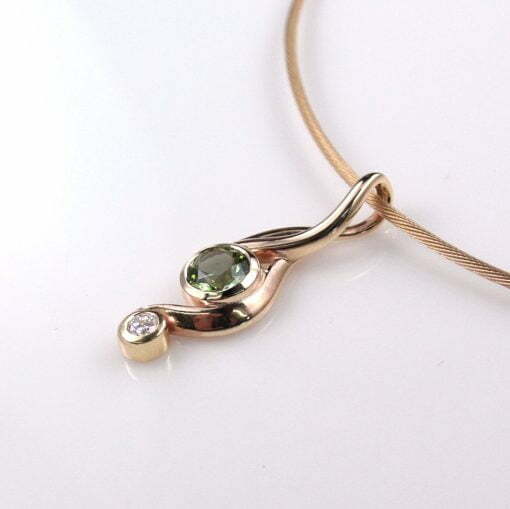 The properties Tourmaline and diamond, alongside the modern bezel settings and elegant design bespoke pendant ideal for both everyday wear and the finest of occasions. Designed and handcrafted in the beautiful Sunshine Coast Hinterland. Right here in our onsite jewellery workshop, by master goldsmith Ishkhan Kojayan. This designer ring is available for viewing in the comfort of our gallery in the heart of Montville, Sunshine Coast Hinterland. This gorgeous organic flowing Pendant design features a beautiful Round Cut Apple Green Tourmaline. Accompanied by a dazzling 0.20ct Round Brilliant Cut Diamond and together set in 9ct Yellow Gold. We have used Bezel settings to help highlight the clean flowing lines of this tourmaline pendant and these gorgeous hero gemstones. Designed and handcrafted in the beautiful Sunshine Coast Hinterland. Right here in our onsite jewellery workshop, by master goldsmith Ishkhan Kojayan. This designer pendant is available for viewing in the comfort of our gallery in the heart of Montville, Sunshine Coast Hinterland.